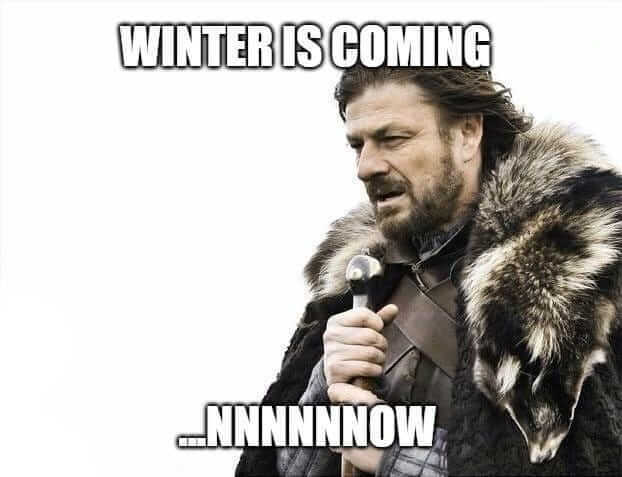 Winter is Coming in the Northern Hemisphere. If you are in one of the newly-liberated provinces or states where “adult-use” marijuana is now legal, you might have been thinking of growing your own. But maybe you were waiting for the first signs of spring before planting your very own little buzzfarm. Well, WAIT NO MORE. Start growing indoors and you will have a tasty crop before the snow melts. In just 12 weeks you can have your first harvest. In this post, you’ll learn everything you need to know to successfully create your first easy indoor grow setup for growing cannabis. For an even more complete introduction to growing, you can download our FREE E-Book from the annoying popup that appears when your browser thinks you are trying to leave this site. If you subscribe to our newsletter, we will send you the free e-book TODAY. HERE WE GO: In just 12 weeks you can have your first harvest. 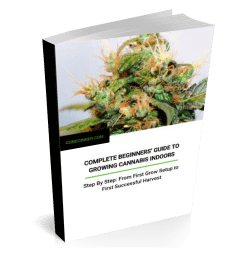 In this beginner’s guide you’ll learn everything you need to know to successfully create your first easy indoor grow setup for growing cannabis. If you’re starting a grow space from scratch, you can design and buy an entire custom grow room package to fit your personal requirements—every item you’ll need to get started, all delivered straight to your door. Just click on the link, select how many plants you want to grow and start designing your ideal setup. Your various options, like lights and growing medium, are all nicely explained along the way. And even if you don’t buy the final package—or if you just prefer to research and buy each item separately—still worth a look. It’ll give you a really good idea of how much a brand new grow space will cost to set up. Instead of doing all the work to convert your basement into a greenhouse, you can start small with just a grow tent in your closet. There are several sizes to fit your needs. The ones we choose for our reviews are all reflective on the inside to make the most of the light source you use. They are also thick enough to keep light out so your plants have their needed rest time. A crucial part of your setup for growing cannabis: You’ll need to get a few seeds. They cost around $10 or more per seed if you buy online from legal sellers (link takes you to our seed buying guide). Once you have those beautiful little babies on hand, you’ll need a place to germinate them. Be sure you’ve received seeds that have a tiger-stripe pattern. Dark seeds are also good. But white seeds or very pale green are often dead and worthless (although very occasionally one might germinate)—seeds that color have been taken from the plant before ripe. Using peat pellets is an easy way to get seeds to germinate. Soak the pellets in water to let them expand. Then insert the seeds so they are about ½” deep inside the pellet. Keep the pellets moist, but don’t water right on top of them so they don’t wash out of the pellet. It takes 3 to 7 days for the seeds to sprout. Once your seeds have sprouted, leave them growing inside the pellet but make sure they have light. From then until they are about 3-1/2 weeks old, they will need 18 hours a day of light and 6 hours of darkness. The easiest way to control this is to put your light on a timer. After they reach about 3- 3½ weeks of age, you can give them 12 hours of light a day and 12 hours of darkness. That will start the flowering stage. 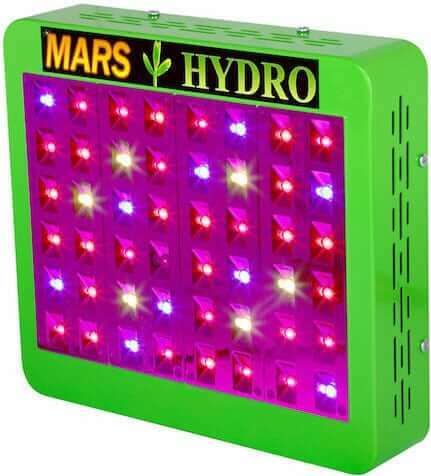 You can read all about energy-efficient LED grow lights in our article. LEDs consume less electricity and produce less heat. That saves you money on utility bills because you use less electricity for light and air circulation. In turn, you’re less likely to get spotted as a grower if you happen to live where it’s not legal to have cannabis plants. As for keeping track of time, we recommend a high-quality programmable timer. However, the cheap ones that people use while they’re on vacation don’t keep time accurately. You want one that can handle the higher amount of current you’ll be drawing if you use a powerful light. 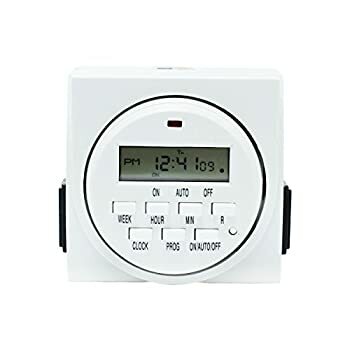 For example, this popular Enover timer is programmable up to 7 days and can handle up to 15A of current. The main downfall is that it isn’t UL or CSA-listed as having passed minimum safety requirements. That doesn’t mean it’s not safe; it just means the company hasn’t bothered to get that certification yet. 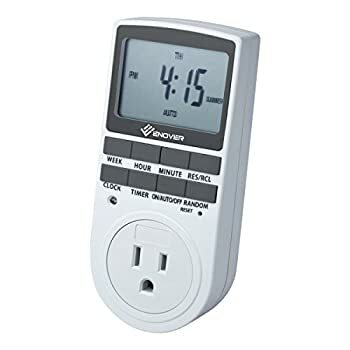 One that is UL-listed and has similar features is the iPower 7-Day Dual-Outlet Digital Timer. It has an LCD display, it can remember 8 separate schedules each day for up to a week, and has two outlets with surge protection. The two outlets will be very handy. Running grow lights means creating heat. While cannabis likes heat up to a point, too much of it and they will burn just like you might on a hot, sunny day. It’s important to circulate air with fans or some other method. It’s also important to control odor later on as the plants mature. 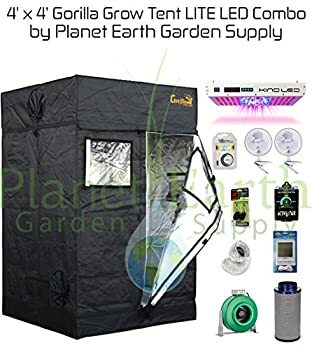 One solution is to use an all-in-one grow tent that comes ready with lights, ducting, and fans—an instant indoor grow setup. Popular manufacturer Gorilla Grow Tents sell a complete 4′ by 4′ by 6’11” grow tent package (height can be extended 12″). 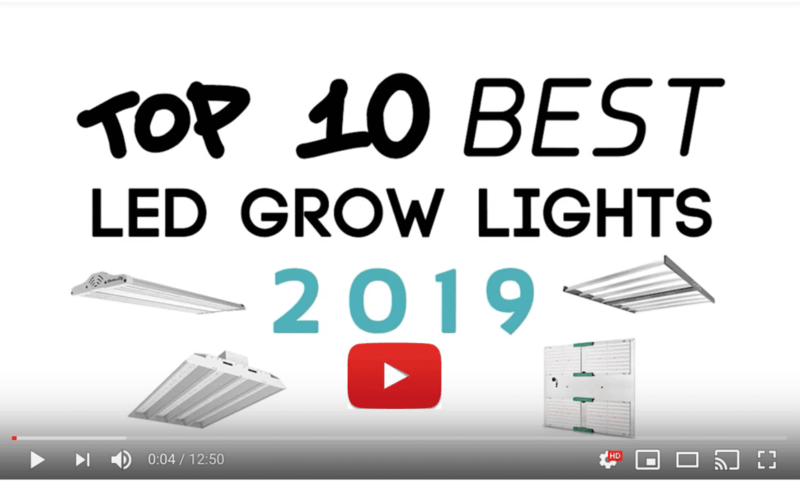 It includes a top 750w LED grow light from Kind LED just right for the tent size (we’ve previously reviewed the very similar Kind K5 1000w), and a fan that moves air in through the tent and out the charcoal-filtered ducts. They also include a hygro-thermometer so it’s easy to monitor conditions inside. 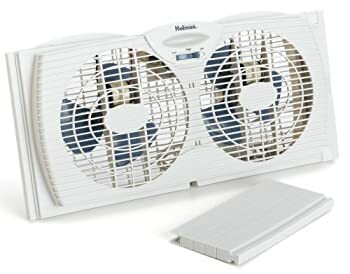 A great option for a stand-alone fan is the Holmes Dual-Blade Twin Window Fan. It’s quiet, has two speed settings, and the air flow can be reversed for exhaust. Another bonus is that the motor is water-resistant. After your seedlings start pushing their roots out of the sides of the pellet, you need to pot them. Leave the plant inside the pellet and put it deep into fresh soil in a pot. You can bury it up to halfway up the stem. So, pots for your pot…sorry, just had to write that. Maybe had too much today already. Fabric pots are the newest, and possibly the best way to grow. They let a plant’s roots breathe and drain so they are less likely to get root rot or root-bound. 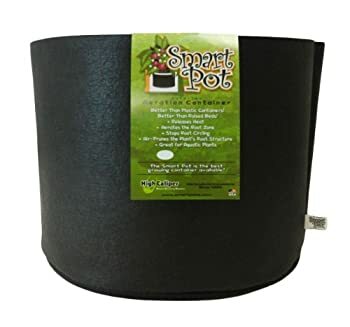 Smart Pots sells several sizes. We recommend 5-gallon fabric containers as a good size. You can choose smaller or larger, depending on your needs. Experts recommend using at least 3-gallon pots if you have over 25-watts of light per square foot. Remember, you’re growing for human consumption, so don’t use junk to grow your cannabis. Organic soil gives the best flavor. 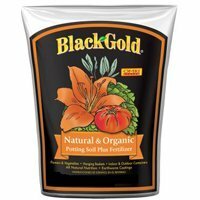 Black Gold sells a 16-quart bag (that’s 4 gallons) of OMRI-certified organic potting soil that has good drainage and air space from pumice and perlite. OMRI-certified means it’s the real deal. It has earthworm castings (yes, worm poop) and other organic fertilizers in it. This means you won’t need to add more nutrients to the soil until the 3rd or 4th week. When the time comes, you’ll need good fertilizer. The same rule applies—don’t use chemicals. You’re growing weed, not meth. Check out our reviews of the best nutrients for growing. If you can use filtered water instead of city water from a faucet, do it. It will have less chemicals. Pop a filter on your faucet for an easy way to have pure water. 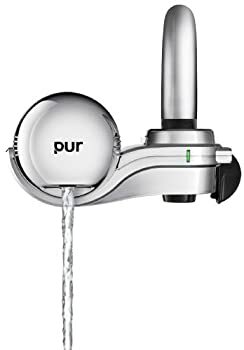 I like the PUR filters better than Culligan or other brands. They have a good reputation, they warn you when it’s time to change filters, and they fit most faucets. Each filter lasts for about 100 gallons. Young plants only need water about once a week. Adult plants will need water about once a day. Some people with larger farms have a drip irrigation system. That’s pretty handy. But probably you can get by with a smaller setup for now. 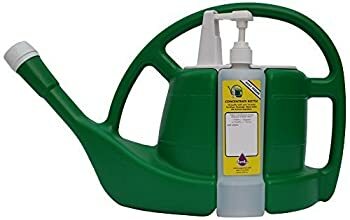 Get yourself a watering can with a long spout. It makes watering simple. Make sure it fits under the faucet. Also look out for one that makes it easy to mix in liquid fertilizer, like this one from Aquavor. It has a built-in fertilizer dispenser. There are a few ways to know if you need to water, or need to wait. Look at the leaves. Are they hanging down? Give water. Does the soil feel warm? Give water. Does the soil feel cool? Wait to water. Or take the guesswork out of the equation and use a hygrometer to see if there is enough water in the soil. 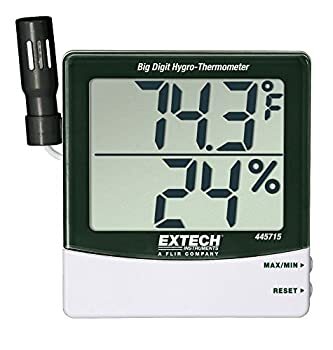 The Extech 445715 hygro-thermometer is a serious tool for serious growers. It measures humidity and temperature accurately and comes with a probe. There is also a less expensive option that only measures moisture in the soil. It’s a sensor made by Etekcity. You insert the metal rod into the soil and the color-coded display shows you how wet the soil is. After your cannabis plants have been flowering for a couple of months, they will have a strong odor. This is when your odor control system is essential. Along with your air circulation system, you need charcoal filters. 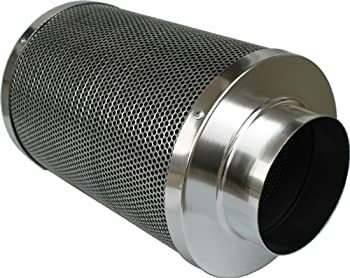 One solution to add to your ductwork is iPower’s inline Air Carbon Filter. It lasts about a year if you reverse the flanges after 6 months. This is probably the lowest-maintenance solution. It’s been about 12 weeks. How will you know when it’s time to harvest? By now, you’ve eliminated male plants, so look closely at the females. Are their white hairs turning brown? 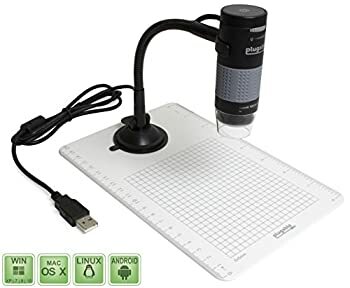 If you had a digital microscope like this one from Plugable, you could look at the trichomes, or sticky things on the buds, to see if they are brown, too. Be careful when you cut the plants. Use good, comfortable garden shears like these from Black & Decker so you can trim the leaves and buds neatly. Yes, you could smoke them now. But in a couple of months, they will be more powerful. Cure your buds for the best results. The all-time favorite way of curing cannabis buds is to place them in glass jars. We like wide mouth Ball jars like these, or even the quart-size jars are nice. Here is a home video showing lovely buds being cured the simplest way. 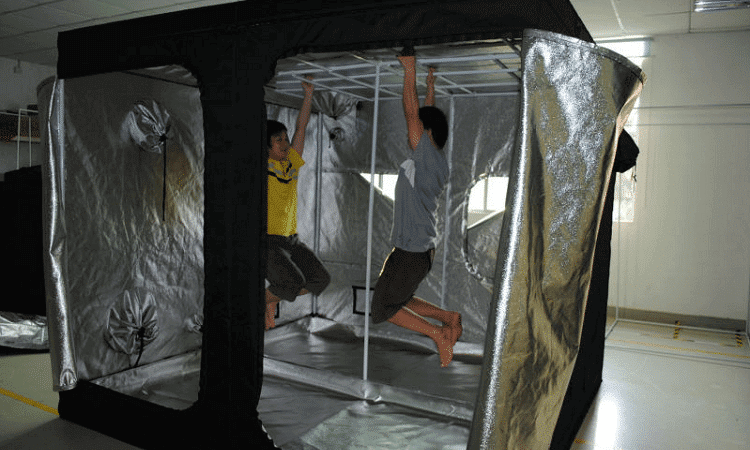 Got your new indoor grow setup in place? Get all the details on growing great weed here with our growing guide. It’ll take you from seed to harvest and on through curing and storing your first great buds. Looking to take your growing up a notch? Or just like to know pretty much everything there is to know before you get started? Ryan Riley’s 839-page Growing Elite Marijuana: The Complete Guide is the professional grower’s bible. It might look expensive, but it should more than pay for itself with bigger, better harvests, time saved and fewer costly mistakes. Although some states have legalized the use of marijuana, most have not. Each state has their own laws about growing and possessing cannabis. Check what the rules are in your area with our interactive map, or by visiting the website of the National Organization for the Reform of Marijuana Laws at https://norml.org/.